Ordering Information: Available through the secondary market. 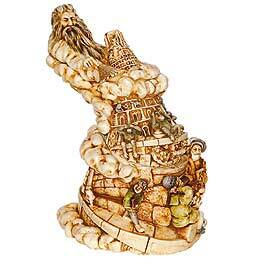 This spectacular limited edition box figurine is the fourth in Harmony Kingdom’s Biblical Series. Depicted is the construction of the Tower of Babel. According to Genesis, men intended to build the tower to reach as high as heaven. Such an enterprising project was possible because everyone spoke the same language. But God foils the plan, “confounds their speech” by creating different languages and scatters the people. The three figures in the foreground may have just been struck by the drastic change: one can’t believe his ears, another covers his mouth in amazement and a third screams into his cell phone in a futile attempt to be understood. In another modern touch, three monkeys perched on the tower see no, hear no and speak no evil. The interior of the first level of the tower reveals a spiral ramp leading up past the sun and the moon. Inside the second level, a man on a ladder comes face to face with an angel guarding the entrance to heaven. Perhaps it is this close encounter with divinity that has sparked imaginations for centuries.